Owning a horse is a dream come true for any horse lover, but it’s an expensive venture. And you want to make sure you keep a tight rein on your emotional and financial investment. Can you afford astronomical veterinary bills if your horse falls ill or becomes injured? How do you protect yourself if your horse injures a rider? Fortunately, you can ease these concerns with equestrian insurance. There are many companies to consider, so we’ll help you figure out how best to compare horse insurance plans. Major medical horse insurance typically covers veterinary diagnostics, treatment, medication, and surgery resulting from an illness, accident or injury. Surgical insurance is an alternative if major medical insurance is out of your price range, but it only covers expenses directly related to surgery, including the surgeon’s fee and anesthesia. It doesn’t cover hospital stay costs, which is a significant part of the bill. Still, having surgical insurance is better than having no insurance at all. You’re required to purchase full mortality insurance when you take out a major medical or surgical policy on your horse. Full equine mortality insurance will reimburse you the value of your horse, determined when you take out your policy, in the event he dies from an illness or accident or if he’s stolen and not recovered. Limited equine mortality insurance will reimburse you the value of the horse if he dies as a result of an accident or illness. You can purchase this type of insurance without having a medical or surgical policy. Loss of use insurance covers you if your horse gets injured or becomes ill and can no longer perform the function you bought him for, i.e., riding lessons, breeding, etc. It pays you the lost income you would have received from the activity minus ordinary expenses. You need to have major medical insurance to purchase a loss of use policy. Horse liability insurance protects you if your horse injures someone or damages property. Make sure your homeowner’s policy doesn’t already cover this before purchasing this type of insurance. 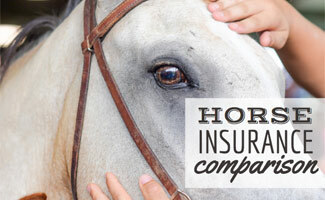 What Should You Consider When Comparing Horse Insurance Companies? There are many factors to consider to compare equine insurance companies and policies. As with any insurance policy, cheap horse insurance isn’t always the best way to go. It’s important to compare horse insurance quotes, but be sure to pay attention to your deductibles, what services are covered and any additional out-of-pocket expenses. In general, you can expect to pay roughly $150 per year for $5,000 worth of major medical coverage expenses. Surgical coverage rates vary widely. Mortality premiums are based on the age, use, and value of your horse. Annual rates can range from 3% or more based on the insured value of your horse. Policies can vary in their exclusions, so be sure to read the fine print. Most horse insurance policies don’t cover horses older than 15 years, and most don’t cover pre-existing and degenerative conditions. Horse insurance policies re-adjust their exclusions and what they consider a pre-existing condition each year. Although you’re renewing a policy, it’s still considered a new policy period. So if something happens to your horse while he’s insured, the insurance company may exclude that condition as a pre-existing condition during the following year. Insurance coverage for horses requires expert knowledge, so it’s wise to go with an agent that specializes in livestock medical and mortality insurance. You should also make sure the underwriters for the company are livestock specialists. How long has the company been in business? What’s their reputation? How do they rate with your state’s insurance commissioner or with A. M. Best, a global credit rating organization that measures insurers’ financial strengths? Do your homework to choose a reputable and reliable insurer. If you’re still on the fence about whether you should insure your horse, be sure to watch the following video for factors to consider. While we’re talking about animal medical insurance, have you insured your pet dogs and cats? You can save a bundle on emergency veterinary bills for your dog or cat with pet health insurance. 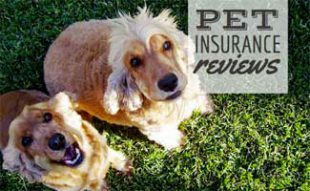 Check out our comprehensive guide to pet insurance, with answers to all your questions and reviews of the best pet insurance plans. What companies would you recommend that offer horse health insurance? Horses are expensive, as is their healthcare so getting insurance for them is well worth the price! What specifically do you need help with, Cheryl?